What’s your New Year’s Resolution? It’s probably a question that you’ve been thinking about lately. With January 1 quickly approaching, it’s time to make a plan and set some goals for what you want to achieve during the upcoming revolution of the sun. If you're a snowsports enthusiast, we recommend that you focus your resolutions on skiing and riding. 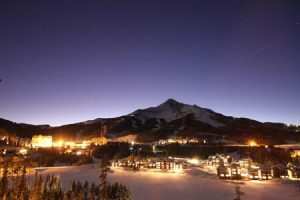 Hit The Slopes - Is this the year of the elusive 100+ day season? Hit the slopes every chance you get so that you can ski and ride more than ever before. Improve Your Skiing And Riding - Take a ski lesson and improve your technique. Get More First Chairs - It’s hard to wake up early, but the reward of first chair is so worth it! Get Your Boots Professionally Fitted - Bootfitting may not be the most glamorous thing, but it makes a world of difference towards your ski performance and personal comfort. Tick Off The Ski Runs On Your Bucket List - We all have a bucket list of terrain that we want to ski. Make it happen this year. Protect Our Winters - Climate change is real. Support organizations like Protect Our Winters and do your part to keep it snowy for generations to come. Make More Chairlift Friends - Strike up a conversation with your fellow chairlift riders. You never know who you might meet. Get Your Ski Legs In Tip-Top Shape - Wish you could ski longer, harder, and faster? It’s time to get those ski legs in shape. Upgrade Your Quiver Of Gear - Whether you need a powder ski or a backcountry setup, invest in the gear you need to enjoy winter to the fullest. Learn To Tune Your Own Gear - Freshly tuned gear skis and rides so much better. Pick up a tuning kit and learn how to tune your stuff. Try New Things - Push your comfort zone and try something you've never done before. Learn to cross country ski, hit a new pillow line, or stomp your first 360 this winter. 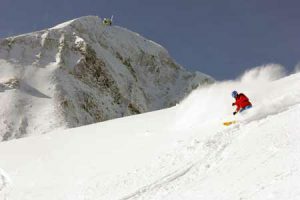 Take An Avalanche Course - The things you learn in an avalanche course can save you life. Take a course and learn about wild snow. 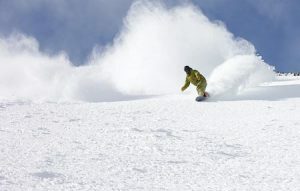 Earn Your Turns - Get the gear to ski in the backcountry or ski uphill at the resort. Go On A Skiing Road Trip - Hit up the local Mom and Pop resorts in your region. Go on a skiing vision quest on the Powder Highway. Head to new zones to ski new places. There’s a lifetime of adventure out there. Stop And Enjoy The Apres - Skiing and riding is great, but don’t forget about apres ski. It’s pretty darn fun too! These are the perfect New Year's Resolutions for skiers and riders. Make skiing and riding your #1 priority next year. You’ll be glad you did. See you on the slopes!